Philips' Window Shopper Gaze Tracking System | OhGizmo! If it wasn’t bad enough that stores were already tracking the purchase decisions and buying patterns of their customers, it now seems that Philips is developing a way for stores to track the interests of people who haven’t even come inside. 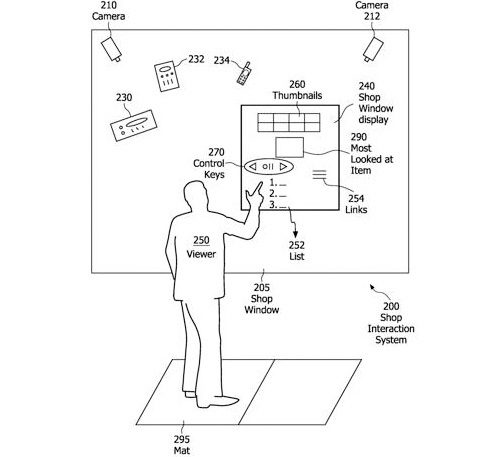 Using a set of video cameras and eye tracking software the system will be able to tell what someone looking at a window display has been staring at the longest, and will then provide more detailed information about the product via a passive or even interactive video display in hopes it will push them towards making a purchase decision. The system is also useful for keeping track of gazing trends for large groups of people. The data can help a store determine what type of layout or window display design is most effective for selling a given product. If you’re looking for a way to make your Monday even duller than it already is, you can read the full patent application for the gaze tracking system on the World Intellectual Property Organization website. Purchase decisions, buying patterns, all the privacy details that go along with it, face recognition databases http://www.dailymail.co.uk/news/article-566181/Hi-tech-face-recognition-cameras-used-Budgens-spot-underage-drinkers.html OUR EVERY MOVEMENT http://technology.timesonline.co.uk/tol/news/tech_and_web/article3945496.ece … And now where you’re looking at. Great. What other unconscious body functions haven’t been commercially exploited yet? I always considered eye contact to be a rather intimate gesture. I assume these systems are perfectly able to gather their data without having to display a user interface, without needing to give you any feedback that you as a passerby are under “marketing surveillance”. So, no more expectation of privacy even when you’re looking at inanimate objects. Constant fear that someone is trying to manipulate me into giving them even MORE money. (Well, SOMEONE is going to have to pay for these systems. Guess who that’ll be…) Wrap our eyeballs in tinfoil, or what? Marketing genius. Although I do not agree with the principles involved, it is a pretty nifty idea. Invariably, however, no matter how “gizmoish ™” it may be, I say stuff it. Patent or no patent, this should not be allowed. Yes, we may be able to use it to catch petofiles or thiefs, but we can not forget that the majority of us are honest people – let’s please, please keep some things private.